Raw photos occasionally open as double images. The only way to fix this seems to be to close and reopen Affinity Photo. I never saw this before. Does this happen consistently with the same RAW files (or files from a specific camera) or it's random? Can you upload the RAW shown in the screenshot above using this link for us to try to reproduce this here? Did this go anywhere? I'm seeing it too: v1.6.6 on High Sierra with X-T2 raws. Open OK in RawTherapee. OK if I quit Affinity and re-start. I haven't experienced it recently. Mine's a lowly TZ100. Wish I has an X-T2! I'm experiencing this too (High Sierra, Fuji X100F RAWs). For me, this seems to be associated with using the Apple RAW engine (selected via the "Assistant" menu in the Develop persona). It went away when I switched back to the Serif engine, though that might be co-incidence. The image opens fine for me via OSX's quick look feature, as well as in the Preview app. I've also seen the doubling change for the same image (eg. I had one occurrence where the image was duplicated into the top left corner, and another one where the bottom half was repeated one on top of the other). So I suspect this isn't a case of file corruption. Ah, I seem to have the Serif option selected. Perhaps that's why I haven't had a problem recently! Thanks, I too seem to have the Apple option selected (dates from my X-E2 firmware 4 update), I'll report back if it recurs. Are you running macOS High Sierra too? Hi MEB! Yes, I'm running High Sierra. Thanks. From the info above this seems to happen on High Sierra using the Apple (Core Image RAW) with some cameras (Fuji X100F, Fuji X-T2, Panasonic DMC-TZ100 at least). Has anyone checked or is running the latest Photo Beta? Is this happening there too? I will try to reproduce it here and fill a bug report. Bit more testing. I never saw it with X-E2 v4 RAWs but only X-T2 (latest firmware). 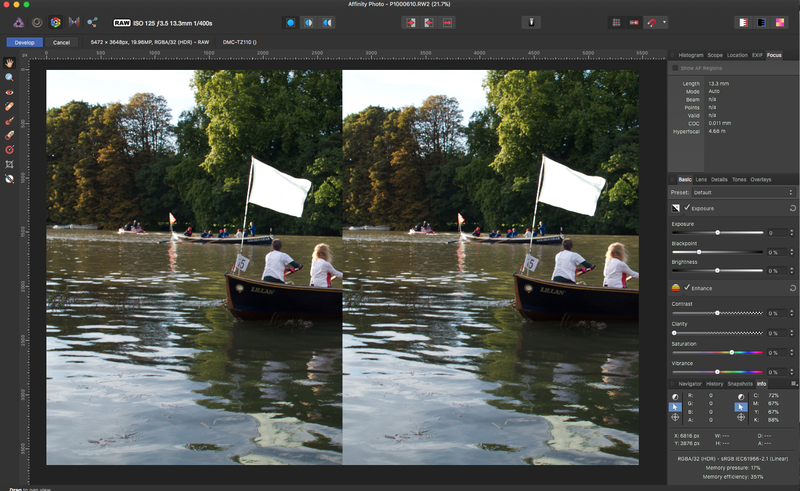 Seems cured with the Serif RAW engine and X-E2 v4 now supported too. High Sierra and Affininty 1.6.6 here. I'll try a few more files and report back if it fails using the Serif RAW engine. Still seeing this in 1.6.7. Will this be addressed in the next beta? I've been able to reproduce this on a system running High Sierra. This issue is already logged to be looked at. Thanks. I didn't see it using the Serif RAW engine, but I've not been doing that much with RAWs recently. Have those images ever opened correctly for you in previous versions of Affinity Photo or it has been always like this (double images)? When this has happened, I've closed Affinity Photo and reopened it. This has usually fixed the issue, which makes me wonder if it is a memory issue. I guess that 8GB RAM doesn't go very far when you're running a number of other programs and opening large files. I first saw this issue last fall, I believe - unsure what version I was on then. It has been very hit or miss for me. Sometimes restarting my MacBook works for awhile, sometimes not. Not every RAW file fails. I have never seen it with the Serif RAW engine, though. I made some some posts at that time, I will search for them. Hope this helps - and glad to hear it was logged, though I thought this had already occurred. I am also having this problem with .ORF files from an Olympus TG-4. Running Affinity Photo 1.6.7 on High Sierra 10.13.3. Restarting AP and restarting Mac makes no difference. Using Serif to process raw rather than Apple seems to "solve" the problem but I prefer the Apple algorithm, so it would be awesome if this could be fixed. Happy to provide any further details and sample files that might help. Thanks. Do you mind uploading one of your files using the link i posted in the second post? Do you remember if this was also happening for you with older versions of Affinity Photo on macOS Sierra? Is this using the Serif or Apple raw converter? According to his post he's using Apple (Core Image RAW).